How do you know when wine grapes are ripe for harvest? What sort of testing is done to ensure that they are ripe from both a visual and scientific perspective? How do underripe and overripe grapes affect the final outcome of a wine? Does this change with vintages? From the vine’s perspective, the goal is to ripen fruit sweet enough to attract birds (who will eat the grapes and leave the seeds along their path of travel) and seeds ripe enough to develop into vines. As vague as all that is, it does give us some guidance in the search for ripe grapes. Fortunately, wine people are far more specific and there are plenty of definitions of ripeness within the professional community. Unfortunately, wine people aren’t always on the same page when it comes to ‘optimum ripeness,’ and there’s an elephant in the room to address before moving into the fun stuff. If we’re making a sparkling wine in Champagne, then optimum ripeness is a little under-ripe. If the end-game is a late-harvest style Zinfandel in Paso Robles, then optimum ripeness is over-ripe. The wiggle room here is dance-hall big and winemakers dance all the way around it. Sometimes twice. Because it’s their wine and they can have those grapes as ripe as the season will allow. The goal is always the same: have enough sugar and flavor in the grapes to make the wine you want to make. That gets tricky some years, where under-ripe grapes can lead to grassy flavors and overripe grapes makes for dusty, dried fruit nuances. Some years you get unevenly ripened bunches means picking out little green marbles AND golden raisins from your Sauvignon Blanc. In years where the weather doesn’t cooperate, optical sorting (computerized eyes) and hand sorting (picky winemaker eyes) are key. Otherwise the wine we want and the wine we get may be worlds apart. So, what, pray tell, do we look for in the vineyard? Winegrowers and winemakers follow the grapes’ lead during the dance of harvest. There are two specific types of ripeness for winegrowers. Sugar ripeness (enough sugar to reach your desired style of wine) and phenolic ripeness (the development of flavor compounds that make that bottled juice delicious). And the two don’t go merrily hand in hand through harvest. Those loving glances between a winegrower and their grapes are more like interrogation stares. As grapes ripen, the relationship between the sugar content and the acid content of the berry is inverse. That is, as the sugar levels increase the acid levels decrease. Which is why phrases like “the riper the berry, the sweeter the juice” exist. Side note: Grape sugar is measured in degrees Brix. It measures the ratio of sugar to solution in the sugar solution, so the more grams of sucrose in 100 grams of solution, the higher the Brix. 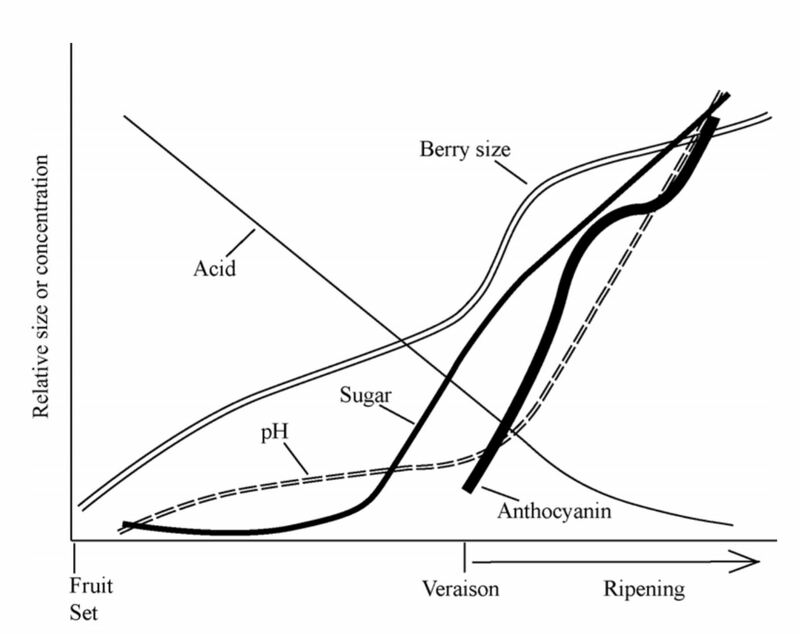 Now, there is some correlation between the increase of sugar level to anthocyanin level but there’s also some disagreement about if a relationship exists…and if so to what extent. Sort of like dating in middle school. Now, let’s talk about anthocyanins and phenolic ripeness. Two daunting words that only geeks and professionals dare utter with any confidence. Both are usually wrong, but I digress. Phenolic ripeness refers to the optimal development of grape flavor compounds in the skins, seeds, stems, and (as we’re learning with every new study) within the grape flesh itself. A group of these compounds are anthocyanins. And this is where the winemaker’s loving look at golden or purple grapes in the vineyard comes into play. You can walk into a vineyard and see the color development in a grape’s skin. But there’s more than meets the eye. So, we squash a bunch of grapes in the vineyard to see what that may be. Let’s start with a visit to your local harvest lab. There are rapid phenolic panels, a series of lab tests, which test for phenolic ripeness in the skins and seeds of grapes. For reasons beyond my control (this isn’t an ideal setting for a long, drawn out chemistry lesson), these specialized tests are best handled by the experts. And visiting the chemistry genius’ is always a fun afternoon. Number 2 is the Refractometer. The love child of a kaleidoscope and a test tube, this handy bit of field equipment measures the sugar levels in freshly squished grape juice. In the viewfinder versions, you place a bit of grape juice in the slide and the daylight shines through it. As light shines through a liquid, it exits that liquid at an angle. Different thicknesses of liquids (read: greater sugar content) refract at different and predictable angles. So, this is the ultimate “follow the light” measurement. And yes, digital versions exist. They’re just not as much fun. (It’s a sort of DC vs. Marvel argument, but there you have it). Diagram explaining how a Refractometer works. Image courtesy of ChemBuddy.com via Refractometer.pl. And the universal favorite reason to squish a few grapes is The Taste Test. Despite all the new technology, winemakers and winegrowers can tell quite a bit about the balance between acidity and sugar and anthocyanins by chewing grapes. It’s not particularly techie, but it has proven itself reliable over the millennia. Did you enjoy this article? Find more articles written by Maisie here. Wanderlust lured Maisie from a comfortable career in commercial land developement in 2008. She jumped corporate ship and started studying one of makind's largest and most ancient fascinations: wine growing. She's WSET III certified and splits her time between technical writing for Fruition Sciences (dirt and vines) and flavorful writing for Good Company Wines (globe trotting by the glassful). Her studies at UC Davis, the Napa Valley Wine Academy, and elsewhere ensure that what she doesn't know, she will soon find out.